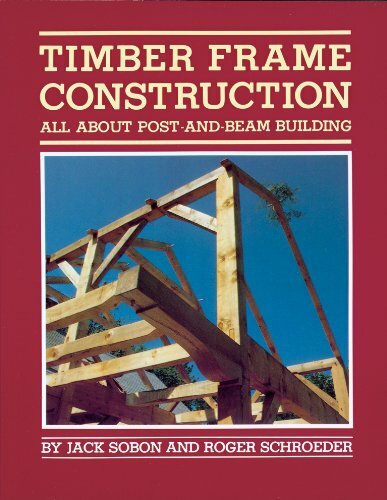 I bought Timber Framing Construction: All About Post-And-Beam Building not because I thought I would actually build an entirely timber-framed building, but beacuse I wanted to understand the history of post-and-beam structures so I could judge what modernizations had probably been brought to it. I think its title is about twice as long as it needs to be. As a historical book, it’s a pleasure to read. Being phrased as a ‘how-to’ manual frees it from the drudgery of many historical books; the authors can get on with the business of showing the reader the how. It’s rhapsodic about different joints, clever applications in specific buildings, and the joy and pleasure of using hand tools instead of clumsy, noisy power tools which are clearly indicative of a moral and spiritual failure on the part of the user, not that they’re ones to judge. The authors never quite rise to the level of claiming that a man with a chisel could assemble a barn more quickly than a trained team of Navy Seals with power tools, but one always gets the feeling there will be pictures of it on the next page. They don’t entirely support their claim that timber framed buildings can be cheaper than stick buildings, and they entirely dodge the fact that stick construction has come about due to a shortage of the first-growth timbers that ‘the oldsters’ as they call them with near-worship could reliably find in the course of clearing a building site. In fact, the worshipful tone toward anything and everything ‘the oldsters’ knew or did wears pretty heavily, and they can’t keep their condescension hidden when they discuss modern post-and-beam construction. One imagines, though, that plenty of their oldsters would be pretty damn pleased to find standardized lumber, or secure hardware. I don’t mean to complain unduly; I only think the authors made a bigger claim than they should have. This book is about historical timber framing techniques, and how they can still be applied. In short, an interesting book if you are investigating strictly old timber-frame techniques. If you think this new craze called ‘steel’ is pretty cool, and that it may have a place in your building, though, you will not want this to be your only resource.